Sports Costs > How Much Does Fantasy Football Cost? How Much Does Fantasy Football Cost? Fantasy football is an interactive online football competition where you compete with other people from all areas of the world or with your friends and family members. With fantasy football, you act as team manager of a football team, where you will virtually draft, trade, add, or drop players and change rosters. The better your player does in real life during the game, the more points you get. On average, a fantasy football team can be free or can cost up to $500 or more per team depending on what site you sign up with, the prize you want to win, as well as other various factors. Usually, most of the online football fantasy leagues charge $10 to $100+ per team, but it can be much more than this. The more you pay in fees, the higher the prize can be at the end of the season. For example, CBSSports.com Fantasy Football charges $39.99 per team for the gold version with a $200 league champion prize; the Platinum version costs $99.99 per team with a $600 league champion prize; the Diamond version costs $249.99 per team with a $1,600 league champion prize; and the Double Diamond version costs $499.99 per team with a $3,500 league champion prize. Fantasy football allows you to run your own team of professional players. At the beginning of your league, you will either draft your team live or you can have the computer draft your team for you based on the rankings you choose. Most websites will have lists already compiled, but you will be free to rank players as you wish. Other leagues may have an auction-based system where you only have so much money to bid on your players. Most websites are based on a points system and will have their own formula. For every 10 rushing yards a running back gets, for example, you may get one point. A touchdown can count as seven. The administrator will have the right to choose scoring options, so these scores will vary across the board. Common point systems look like this: one point for every 25 yards a quarterback throws; four points for every touchdown thrown by a quarterback; -2 points for every interception; for rushing, one point for every 10 yards; six points for every rushing touchdown; one point for every 10 yards for a wide receiver; and six points for every receiver touchdown. An extra point will be one point, while field goals, depending on the distance, can be three to five points. During the season you will set your lineups before each week, accept or reject trades, sign free agents from the free agent list, and your goal, depending on the league you’re in, is to either beat your opponent or have the most points for the week or season. You are entitled to claim the price if your team wins and you meet the website rules. Be sure to read the details on how you can win the prize as well as how you can claim it. Most websites pay prizes to the top three winners. Bigger leagues may offer prizes to more people. This is the most popular league and will begin by players either drafting live or via an autodraft. Each week, players will set their lineups based on the league’s rules. With standard draft leagues, there are two popular types: the head-to-head and by total points. With the head to head, a team will play a different team each week and the team with the most fantasy points during that matchup will get the win while the other team gets the loss. Toward the end of the regular season, the teams with the best win/loss records will face off in a playoff. With a total point league, teams will try to accumulate as many points throughout the season and won’t face off against each other. The teams with the highest points at the end of the season will advance to the playoffs. Like a standard draft, you will still have your head to head and points system. The only different here is each player will get a certain amount of money they can use to bid on their players to fill their roster. Each player can bid on whoever they like, and the same player can be on other teams, but if a player spends too much on a certain player, the other roles may suffer since they will have less money to spend. Dynasty leagues will spread out over the years to come and won’t last one season. Players will remain on one team from one season to another unless they are traded or released by the team. When each new season begins, a rookie-only draft will happen. This is a combination of a dynasty and standard draft league. At the beginning, players will be draft; however, owners will only be able to keep a predetermined number of players from the season before. This will depend on the league’s rules. This league will use defensive players alongside offensive players. Since most leagues will only use a team’s defense, this involves more research since defensive players will have individual points similar to the offensive roles. This league will usually start as a standard draft, but what makes this unique is that a team with the least amount of points for the week will be eliminated for the season. Some websites have premium add-on options. For example, the NFL.com fantasy league has the “optimize the roster” option for an additional $3.99. This option allows you to swap players once the week starts. 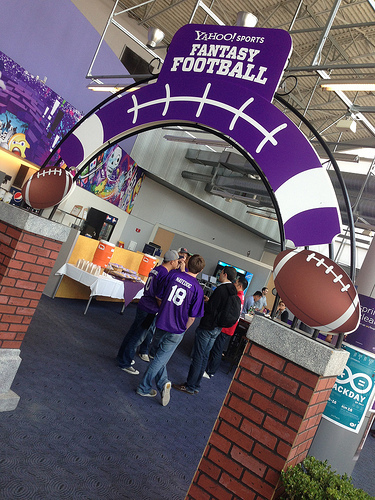 Some popular chains such as Dave and Buster’s and Buffalo Wild Wings allow you to hold draft parties for a small fee. According to this Reddit.com thread, for example, a member had their draft party at Dave and Buster’s and was able to get a private room, draft kit and 10 percent off coupon. He said you had to pay a $200 minimum. Outside of the regular season, some websites may have an option where you can play during the playoffs for an additional fee. While optional, some players pay for premium fantasy football advice and tools. How many people play fantasy football? During the 2015 season, it was projected that nearly 75 million people played. HerFantasyFootball.com breaks down the common fantasy football abbreviations. Joining games for free will save you money. Consider free fantasy sites such as Yahoo!. Keep in mind that many free services generally do not have cash prizes, but some do. Read the fine print before joining. If you have more than one team you can also receive discounts on some sites.